If you think Fattigmann (English: Poor Man) is for the poor, think again. With ingredients like cream, egg yolks and cognac, it should perhaps be called Rich Man. This is a popular Norwegian Christmas cake which requires some work effort. 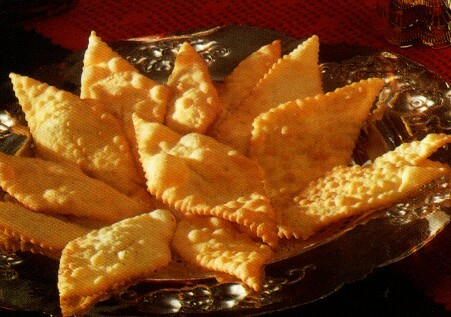 The cakes have a characteristic shape and are fried in lard. No Christmas without Fattigmann! Whisk egg yolks and sugar. Whip the cream and mix in the egg and sugar mix. Add brandy and spices. Beat egg whites stiff and mix gently. Stir in about 7 oz (200 grams) of flour and leave it covered and cool until the next day. (The Fattigmann dough is even better if you leave it covered and cool for a long period, preferably until the next day). Roll the dough very thin in several portions, using the rest of the flour – or as little as possible. Cut out the “collars” using a pastry crimping wheel. Make a split in the center of each collar, stick one of the ends through the split and pull very gently. Boil them in lard until light golden. Use a wooden stick to see if the lard is hot enough. If it creates bubbles, it is ready for cooking. Be careful when you use lard. It gets extremely hot and it is easy to burn. Never put water on a grease fire and cover the pot with a metal lid to prevent an accident.